Funeral services for Francis John Boyle, age 64, of Decatur, will be at 12 p.m. on Thursday, Feb. 14, 2019, at First Baptist Church Decatur with Blake Kersey and Roger Jenkins officiating; interment in Mt. Carmel Cemetery in Berlin. 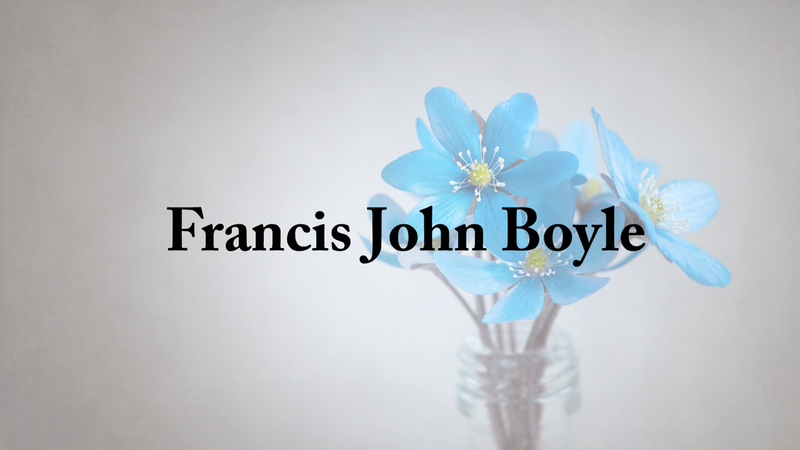 Mr. Boyle passed away on Feb. 9, 2019. He was born June 8, 1954, in Tennessee to John Theodore and Floy C Boyle. He grew up in New Jersey and traveled through many states with his job before settling in Decatur, AL. The focus of his life was faith and family. He loved God. He was a member of the First Baptist Church Decatur where he worked in the preschool ministry. He was Mr. Frank to them, and they loved him and his playful ways. He also worked many years with the Hispanic Children’s Ministry at Central Baptist Church. He had a zest for living in the outdoors. He was an avid kayaker, biker, and hiker. His loving dog, Bonnie, joined him on these excursions. Survivors include his wife, Jamie Thomas Boyle; parents, John Theodore and Floy C Boyle; daughters, Melanie Marie Polo, Jennifer Erin (Shanon) Anderson, and Julia Claire (Jeremiah) Fern; grandchildren Olivia, Charles, Zachary, Wesley, Jordan, Jillian, Vivian, Ale, and Sofia; brother, Steve (Tina) Boyle; sister, Noreen (Rick) Heebner; brother, John (Donna) Boyle; and a host of nieces, nephews, and family. Frank loved his family beyond measure. Visitation will be from 6 p.m. until 8 p.m. on Wednesday, Feb. 13, 2019, at Cullman Heritage Funeral Home. He will lie in state on Thursday from 10 a.m. until 12 p.m. before the funeral. In lieu of flowers, the family requests donations in his memory be made to First Baptist Church Decatur, AL, Preschool Ministry.